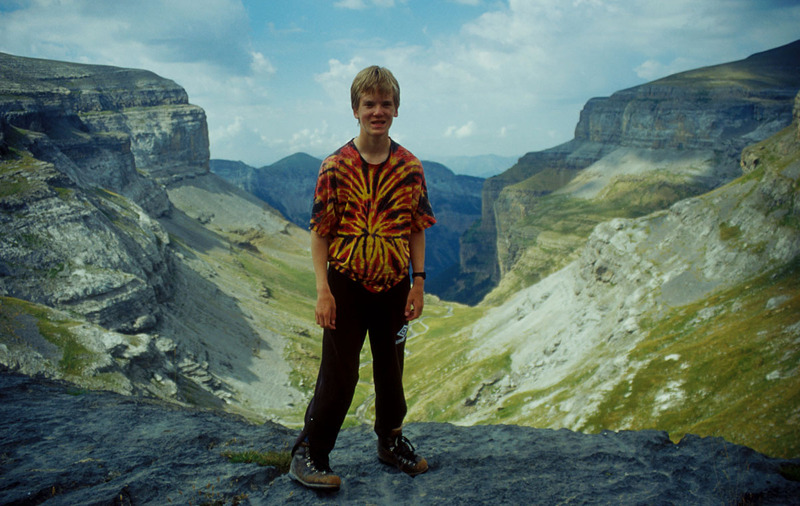 How to get there: The mountain is located centrally in the Spanish national park Ordesa. The nearest town to which one can drive is Torla. The national park service operates a bus service from here and into the canyon Valle de Ordesa. The official parking is quite expensive for multi day parking. (They should give more discounts to long time hikers and thus eliminate all the cars parked elsewhere!) Torla is about 4 hours drive from Toulouse in France. A popular mountain hut is refugio de Goriz, it can often be full and we had some slight problems convincing the staff that we really needed to stay there, even without an advance reservation. Now, we know so an advance reservation is strongly recommended. The Refugio has phone number 974341201. Route description: We climbed this mountain on our way back from Refugio de Goriz (see Monte Perdido). The shortest access from the Ordesa canyon would be to trace our route backwards. From refugio de Goriz one follows the trail to refugio de Sarradets (on the French side) for a few kilometers climbing out of the very upper remains of the Ordesa canyon. After easy hiking on a good trail one reaches the pass (col) overlooking the flat grassy area called Plana de San Ferlius. From here immediately hike onto the north ridge of Tobacor. The ridge is easy to follow, never steep or exposed, but with a very nice view. 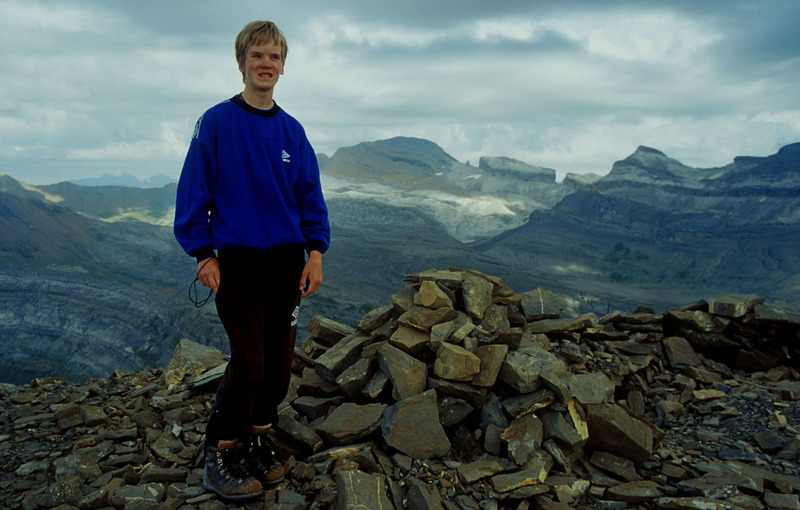 From the summit there is a panorama view, one get to appreciate the closeness of the Ordesa canyon. The canyon really circles Tobacor for about 270 degrees, Tobacor must be made of hard stuff and deserves quite a bit of credit for the impressive Valle de Ordesa. It is possible to continue a bit along the ridge to the west to reach a lower summit (2751 m), but then one should return along the same ridge route used for the ascent. Back at the pass, we decended back into the Ordesa canyon on the north west side of Tobacor. This trail descends steeply down several sections (the trail is on the left hand side of the valley (south side) when decending), with completely flat grassy meadows in between. At about 2000m elevation the trail reaches a vertical cliff area (Clavijas de Cotatueros) where a traverse of the rock face is facilitated by a chain and several irons attached to the rock. This section is not suitable for hikers that are uncomfortable with exposure. Care should absolutely be used, for a few meters there is nothing but the irons for foot and hand. Most "tourists" coming up from the Ordesa canyon will find this a good place to turn back. From this point one can descend into the canyon, or hike along the trail that stays high south of Punta Del Gallinero. We did this and it should be highly recommended. A very nice trail that followes the bottom of the vertical cliffs before it eventually descends to the valley floor at Casa Olivan. From here we continued across the river and followed a broad, but nice trail all the way back to Torla. Comments: This mountain is not very high, but its isolated location, the canyon and the long, nice ridge approach makes it well worth a climb. During our last hour hike back to Torla we encountered a thunder storm with hail as big as one centimeter in diameter, a hard hat had been very useful! Just a reminder of what sudden changes are possible after three very nice days in the Pyrenees. On the summit of Tobacor. Our trail back down to the canyon. There are two steep steps, the second one enters the canyon with a short, steep drop. There are fixed bolts for hands and feet on a short horizontal traverse.